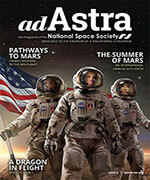 Buzz Aldrin, the second man to set foot on the Moon, has proposed an answer to the Louisiana oil spill. 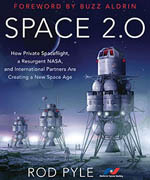 It’s solar energy harvested in space, known in the space community as Space Solar Power. Click on image for larger version. May be freely distributed. We’ve been harvesting solar power in space and sending it to Earth since 1962, when the first commercial satellite, Telstar, was launched and began transmitting energy harvested by the solar panels studded all over its beach-ball-like surface. Today, the space solar power harvesting business is a quarter of a trillion dollar industry. We call it “the commercial satellite industry.” That industry uses space solar power transmitted to earth for everything from satellite radio and television to direction finding via GPS. The Japanese space agency, JAXA, has committed $27 million to space solar power and has plans for a satellite capable of powering 300,000 homes. JAXA says it has the backing of 15 other nations in its effort. And Russia, China, and India are all working on space solar power development. 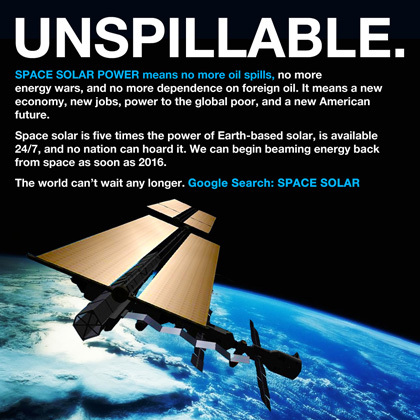 Space solar power means no more Louisiana oil spills. No more carbon in the atmosphere. No more nuclear waste. No more energy wars. No more nations hogging resources and driving up prices. And no more villages in the hinterlands of Africa and Asia kept in poverty by the cost of running landlines hundreds of miles to reach them. There are currently four American commercial companies seeking capital to make space solar a reality: Solaren, the Space Island Group, Space Energy Inc, and Managed Energy Technologies LLC. One of those firms, Solaren, has a power purchase agreement with the California’s Pacific Gas and Electric and anticipates being able to begin delivery of solar power from space by 2016. Take the load off the Earth. Drill up not down. From a press release of the Space Development Steering Committee. A larger version (1050 x 1050 pixels) of the “Unspillable” graphic is available on the NSS website and may be freely distributed. Image credit: Jason Louv.